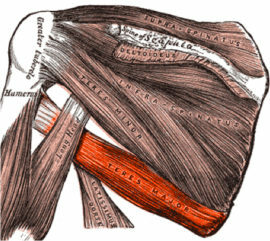 The Teres Major is responsible for shoulder adduction, shoulder extension, and medial rotation of the arm. 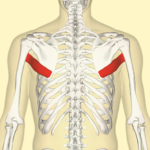 Another very important function of the Teres Major is scapula stabilization. I want you to visualize the act of tying an apron. As you pull your arm back behind your torso to tie your apron, the teres major is fully activated. This movement is known as a shoulder extension. As we’ve discussed before, you can improve shoulder pain and scapula stability using strength training. When we refer to the “origin” and “insertion” of a muscle, we’re talking about which end of the muscle is fixed to the skeleton, and which end moves when the muscle contracts. This resource explains this in a bit more detail. The Teres Major is located just below the Teres Minor. The muscle originates from the lateral side of the inferior angle of the scapula, and inserts into the bicipital groove of the humerus. What this means is that it originates from the bottom part of your shoulder blade, or scapula, and connects to the inside part of your upper arm bone in the armpit area. Some exercises that we use here at Vertex Fitness to focus on the Teres Major are the Pulldown, Pullover, and Chin Up. These exercises really target the major muscles in your back that are important for shoulder stability, back strength, and protection of your spine. Strong back muscles lead to better posture and less back pain. A strong Teres Major muscle is vital for keeping the shoulder blade stable and preventing shoulder injuries. The Pullover Machine is a great piece of equipment that strengthens the Teres Major muscle. The key points that I look for while I guide my clients through the exercise are locking down your shoulder girdle, keeping your chest and head up, and driving your elbows down and back behind your torso. This allows our clients to completely isolate their back muscles and keep proper form, reducing the risk of injury.